This last weekend, there were heavy rain and windstorms in our area. As in all such storms, a few people had roof damage. This was not a giant problem, most leaks were small, and it was easy to get supplies and people to fix the leaks. What about after a major disaster or shortage of supplies? Do you have a first aid kit for your roof? To keep a few repair supplies on hand is not a major expense. The following is a simple list of supplies that would let you fix roof leaks and minor damage to your roof. A sturdy tarp for temporary repairs. A roll of heavy plastic for temporary repairs. 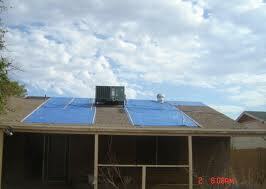 A roll of synthetic roof underlayment similar to Surround by TYPR or Tyvek for more permanent repairs. A bundle of roof shingles for permanent repairs. These need to be kept in a cool place. If they are not they will stick together after a couple of years and be useless. Check them periodical. A vinyl based roof sealer such as Gardner® Wet-R-Dri® 037-GA, All Weather Plastic Roof Cement or a similar product. A good roof repair chalking, that is rain ready and a chalking gun. A bundle of lath for nailing down the underlayment or plastic to keep the wind from tearing it up if needed. The necessary tools, including a good hammer, a box cutter for the underlayment and a ladder to get on the roof. Even if you suffer the loss of many shingles this should let you repair a good portion of your roof and create a dry area. Remember the first and best preventative to keep you from having to use these supplies is to always keep your roof well maintained. Sprouting Seeds is a Good Winter Source of Nutrition. This entry was posted in Self sufficiency, Shelter and tagged Howard, roof, roof repair. Bookmark the permalink. Good thoughts on something many of us rarely consider! Depending where you are, replacing only one or two 4×8 sheets of roof sheathing to repair a roof penetration “may” not require a permit. Check first. and sealed each course with GE silicone caulk. Did cost a bit more than the usual job, but expect it will last as long as I will now.